Close relatives of Shasta Groene say her torment never had to happen, or last as long as it did. Shasta and her 9-year-old brother, Dylan, vanished May 16, when the bodies of their mother, older brother and mother's boyfriend were found at their rural Idaho home. Early Saturday, employees and customers spotted Shasta eating breakfast with Joseph Duncan in Coeur d'Alene. Court documents reveal that Shasta told authorities she and Dylan were repeatedly molested by Duncan, and that she saw him tie up her murdered loved ones. Duncan is being held without bail on kidnapping charges. Remains found in a remote western Montana campsite are being tested, to see if they're Dylan's. The Early Show co-anchor Harry Smith Wednesday that Shasta "seems to be doing really good right now. She looks real good, and she seems to be doing OK for the most part at this time." 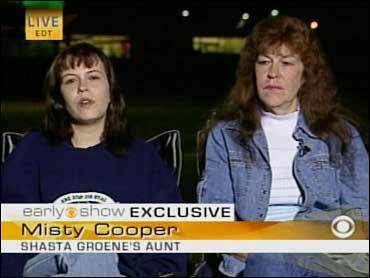 But Cooper, who holds out hope for Shasta's future, says the family doesn't speak with Shasta about her ordeal. "We just go on with everyday normal things," she reports. Shasta's grandmother, Darlene Torres, tells Smith that Duncan was a stranger: "Nobody in the family has ever seen this man before. Ever." She adds that the murders and abductions have been "devastating. It's been very, very hard. Very hard." Torres says it's surprising Shasta was brought back to Coeur d'Alene, noting, "It's almost like he wanted to get caught." Shasta is seen on a surveillance videotape in a convenience store hours before a waitress spotted her in a Denny's restaurant with Duncan and authorities were called. "It's hard to see it," Cooper says, "but you know, nobody recognized her or anything, with all the flyers, our T-shirts and everything that we've done to have her face known out there, that nobody recognized her, it really does hurt. And it's really hard for us." "As far as we're concerned," Torres remarks, "the man should have never been out on the streets. It sounded like this wasn't the first time this had happened. …And if he wouldn't have been (free), maybe this would never have happened." Torres says her murdered daughter, Shasta's mother, "was a wonderful person. She really was. She was a great cook, she had a garden going, she had her flowers. She was always outside working in her yard. Her children were her life. I mean, it's just a terrible thing. It was a family torn apart." But Cooper sounded a note of hope: "As far as the family's concerned, (Shasta) has a great future because, with all the love from us and everybody, I'm sure that, now, it will help her out tremendously."